This article is available in Russian and Spanish as a PDF. Right click to down load. Free Acrobat reader required. For some people the episode of Rama exiling Sita to the forest, while she was five months pregnant, is one of the most disturbing and incomprehensible events in the Ramayana. It seriously tests their faith; and in some cases actually breaks it, leading some to even offend Lord Rama. They forget it is a divine lila and that the Lord has His own reasons for doing what He does, and that they are not always within the purview of our tiny understanding. Most devotees realize that we cannot always enter into the Lord’s mysteries. That we have to accept Krsna on His terms, and that no matter how it may seem to us, that Krsna always has our best interests at heart. To them Krsna is their Lord no matter what, as exemplified in the last verse of Lord Caitanya’s Siksastaka. However the sastras are vast and in them many apparent contradictions and mysteries are resolved including the mystery of why Rama exiled pregnant Sita to the forest. According to Madhvacarya’s Mahabharata Tatparya Nirnaya 2.3-4 the original Mula Ramayana was a massive work consisting of 100 crore slokas (1 billion) while the currently available Valmiki Ramayana consists of only 24,000 slokas. Thus we only have an insignificant fraction of the original Ramayana making for a lot of lacunae that need to be filled in. In this current Kali yuga that will not be possible but we do get some help from the Puranas most of which have parts dedicated to Rama-lila and often fill in some details not found in the Valmiki Ramayana. As an example Srimad Bhagavatam has three chapters (10-12) in canto nine, dedicated to Lord Rama. The greatest repository of Ramalila in the puranas that I know of is the Padma Purana wherein much of the fifth canto is devoted to Lord Rama. It even includes a narration of the Ramayana that took place in a earlier kalpa and is different (kalpa bheda) in some resepects to the more recent Ramayana. This canto is entitled “Patalakhanda” in it the assemble sages ask Suta to give an account of Lord Rama’s activities. Suta in turn narrates a conversation between Vatsyayana Rsi and Ananta Sesanaga. The 57th chapter in the 5th canto reveals the secret of why Rama exiled Sita to the forest but before getting to that chapter let me first succinctly describe what happened in the previous two chapters so that you understand the context. Bharat tried to dissuade Rama by reminding that even Lord Brahma declared Sita to be pure. But Rama replied that He knew that but was afraid of a public scandal and again ordered Bharata to either exile Sita or cut off His (Rama’s) head. On hearing such unpleasant words Bharata also fainted. Up to now the narration is familiar to those acquainted with the Ramayana. The next chapter reveals the secret of why Sita was exiled by revealing the previous birth of Krodhana, the washer man – the only person in Ayodhya who criticized Sita, bringing infamy to Rama. At this point we turn to the Padma Purana canto 5, chapter 57. 1-2. O you of a good vow, tell me how the Lord received the utterance of the censure of Janaki having pure, excellent fame in the world. O Sesa , do that by which my mind shall have very splendid happiness, so that I who drink the nectar coming out from your mouth, shall be satisfied, and by which my worldly existence will be cut off. 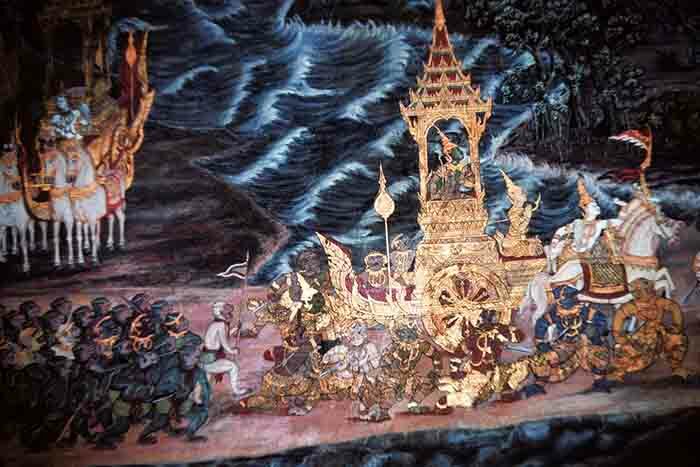 A version of the Ramayana is also popular in Thailand. 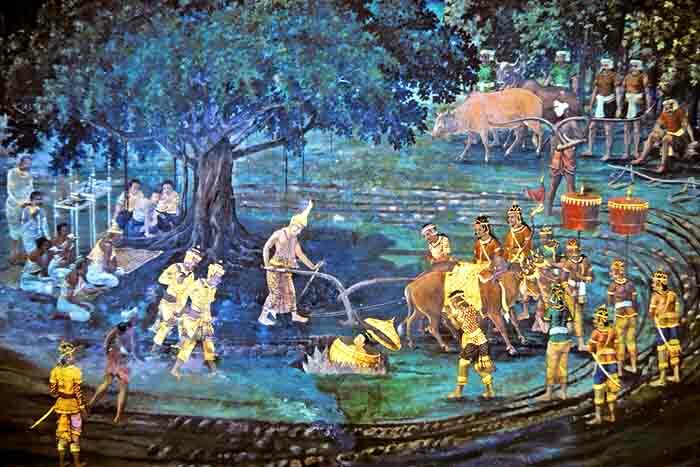 A painted mural at the Emerald Buddha Temple in Bangkok, Thailand, shows the infant Sita sitting in a gold urn as she is discovered by a king ploughing his fields. Click on link to see larger image. In this scene detail from a painted mural at the Emerald Buddha Temple, Bangkok, Thailand, baby Sita’s golden urn is carried to the king’s palace in a royal procession. The beautifully dressed king’s courtiers, carrying the closed golden urn, pass from the back to the front of the right half of the image. Click on link to see larger image. 12-16. When the couple of parrots was conversing in this way, Maithili, observing their words and realizing that this was a divine couple and thinking, “this couple of parrots is telling charming tales about me, ( so) I shall catch the couple, and will ask about all the words, the meaning of which is already expressed” she said to her friends : “Slowly catch this charming pair of the birds.” The friends just then went to the mountain, and caught the excellent pair of the birds, and with a desire to do what was dear to their friend (Sita), reported it to her. Seeing the pair uttering many words in various ways, she comforted them, and said to them these words. 17-18. Do not be scared. Who are you two, the charming ones? Where have you come from? Who is Rama, and who is Sita? Wherefrom did you have the information about them? Tell me all that quickly. Let your fear of me go away. 19-26. There is a very great sage Valmiki who is the best among those who know dharma. That sage made his disciples sing the future adventures of Rama. He, engrossed in the wellbeing of all beings, everyday remembered its words. All those future adventures of Rama, being sung repeatedly, were heard by both of us; they came to us (i.e. were mastered by us) due to repetition. Listen to them. In the end we shall tell who that Rama is and who that Janaki is and what will happen to her with Rama of a playful nature. Glorious Visnu, good stories about whom are sung by celestial women, will, having divided Himself into four, come up at the sacrifice performed by Rsyasrnga. He, having a bow in his hand, will come along with Visvamitra and His own brothers to Mithila. Then there seeing a bow difficult to be taken (i.e. wielded) by other kings, He will break it , and will obtain the very charming daughter of Janaka. O excellent one, we have heard that with her He will rule over a large kingdom. O you of a beautiful body, we who had flown there, heard this and other (things) about you, told by those who lived there. Release us who desire to go. Ramayana Ballet Dance in Prambanan Temple, Yogyakarta, Indonesia. 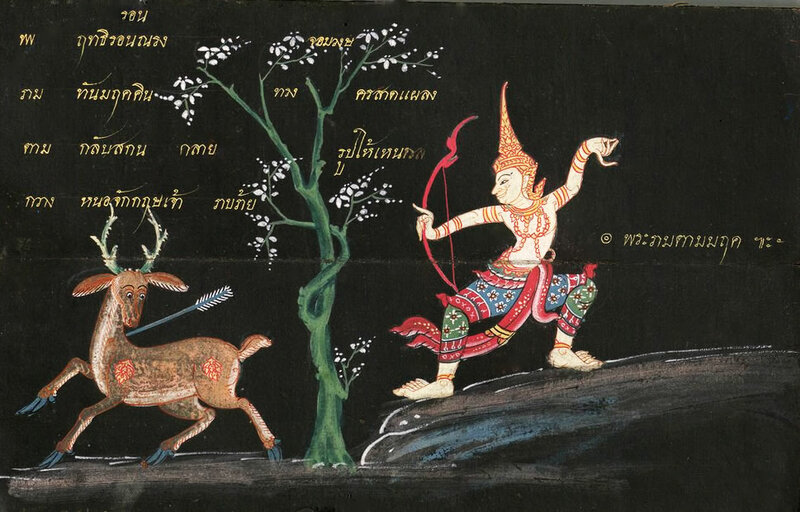 In this scene Rama is about to kill the raksasha Marici who has desguised himself as a golden deer. 27-40. Grasping (i.e. hearing) these words very pleasant to the ears, she again spoke (these) words to that pair of birds : “Where would that Rama be? Whose son (will he be)? In what way will He marry her? What form will the excellent man have? Tell me exactly all this that I have asked you. Later I will do all good things liked by you.” Hearing those ( words), the female parrot , seeing Janaki and realizing in her heart that she was oppressed by love, then said to her: “There will be an intelligent mighty king having a line of chariots, and the scion of the solar dynasty, having resorted to whom gods will be fully victorious. He will have three wives, having forms that will fascinate (even) Indra. On them (i. e. from them) four children (sons) lofty on account of might, will be born. Rama will be the eldest of all. Bharata is said to be (born) after him. After him (i.e. 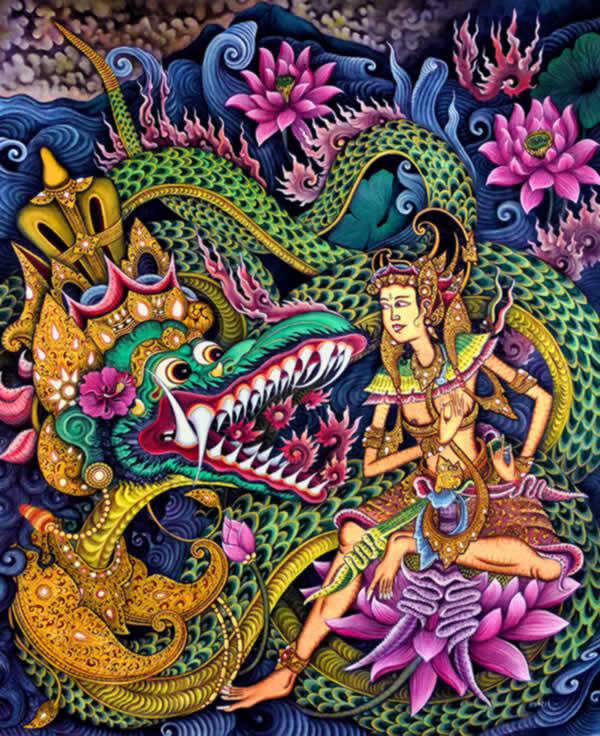 Bharata) Laksmana (will be born), and after him (will be born) Satrughna, powerful everywhere. The large-minded one (i.e. Rama) will go by the name Raghunatha. They will have endless names; O friend, the face of the powerful Rama will be charming like the calyx of a lotus. His very long (i.e. large) eyes will have the beauty of lotuses. His nose will be raised, large and charming. His eyebrows will be lovely and charming due to their being harmonious. His lovely hands will be hanging up to his knees. His very small neck will be charming like a conch. His chest will be plain and expansive and charming. His chest will be pure and will have a mark. Endowed with the beauty of charming thighs and waist, he will have a pair of knees, pure and naturally adored. His lotus-like feet will always be worshipped by all his (votaries). The very charming Raghupati (will be like this). Rama possesses a form like this. Who am I to describe Him? Even one having a hundred mouths cannot describe Him. Then what about birds like me? Seeing his form, (even) Laksmi, charming and having a beautiful body, was enticed. (Then) which (lady) is there on the earth that will not be enticed? He has great power, great valour, and has a very enticing form. What power do I have to describe Rama endowed with all glory and virtues? Thai Manuscript from later half of the 19th century. 57-66. Though admonished with various words, Sita did not release her. The (parrot’s) wife, who was angry, and miserable, then cursed Janaka’s daughter: “As you are separating me from my husband, in the same way you will be, when pregnant, separated from Rama.”2 When she, the afflicted one, was repeatedly saying like this, her life departed due to misery, full of the distress of her husband. For her who was repeatedly remembering Rama and uttering (the name) Rama, a divine car properly arrived. The female parrot became luminous when she had gone to heaven. When she died, her husband, that lord of birds, was extremely angry, and being distressed, fell into Ganga: “In Rama’s city, full of people, I will be born as (a sudra so) that due to my words she will be dejected, and extremely unhappy due to separation (from her husband).” Saying so, he who was distressed, angry, frightened and shaking due to separation from her, fell into the water of Ganga graced with eddies. Due to his being angry, due to his being distressed, and due to his having insulted Sita, he obtained very (mean) sudrahood (as he was born as) a washer man named Krodhana. That best bird (or best brahmana) who, doing ill to the great, abandons his life through anger, obtains sudrahood after he dies. That took place. Due to the words of the washer man she was censured and separated. On account of the curse of the washer man, she was separated (from Rama), and she went to the forest. 67. O brahmana, I have told you what you had asked about (Sita), born in Videha. Listen to the further account here (i.e. regarding Sita). I (shall) narrate it. Read about other mysteries in the Ramayana. Is “Sri Lanka” the “Lanka” of the Ramayana? The short answer in no, but to find out how and why read the article. 1. One may wonder how it is that parrots can have an intelligent conversation with a human. 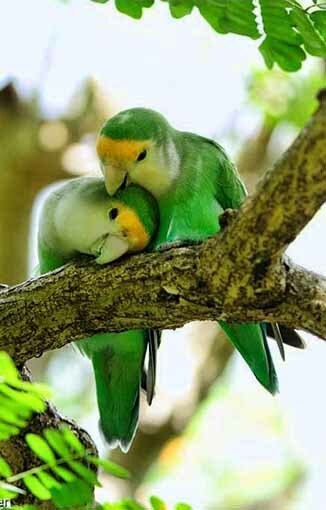 First of all it is stated that the parrots were divine suggesting capabilities beyond the ordinary. 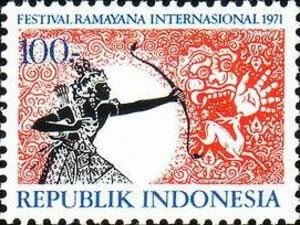 Second of all the Ramayana takes place during Treta yuga a period of time that ended about 869,000 years ago. During Treta yuga it is described that people lived an average of 10,000 years, were much more intelligent, possessed mystic powers and in many ways significantly more advanced than today. And, that with each successive yuga they deteriorate till they reach a nadir in the current Kali yuga that just started 5000 years ago. So if humans were more advanced and deteriorated then presumably the same happened to other life forms not just humans. A prominent element of the Ramayana is the existence of animals specifically monkeys and bears who can converse with humans and who also possess yogic powers. 2. It may be asked how is it that divine Sita (and Rama) can be affected by a mere curse? The answer is that in His lila Rama and His divine associates are perfectly playing the part of humans and as such allow Themselves to be subjected to such things as curses so that the lila can be performed. 3. This episode could have taken place in this last enactment of the Ramayana or in some previous Rama-lila. It should be understood that the activities of the Ramayana are not a singularity but rather repeat on a regular basis in different Manvataras and Kalpas (very long spans of time). Each of these Ramayanas is basically the same but with some variations. So the reason that Sita was separated from Rama may be different in each enactment of the Ramayana. This is called “Kalpa-bheda,” difference in the lila (pastime) because it is a different time epoch, by the learned. Vyasadeva (1990). Padma Purana (Deshpande, N.A., Trans. first edition, vol. 5). Delhi: Motilal Banarsidass Publishers Pvt. 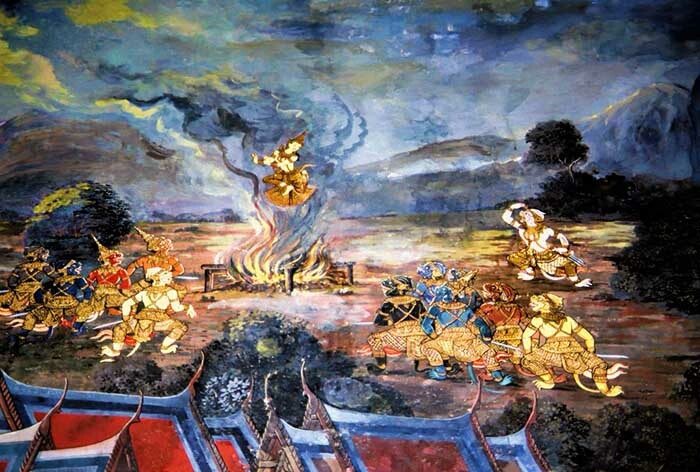 LTD.
Sita undergoes a fire ordeal, as seen on a Ramayana mural at the Emerald Buddha Temple. In this depiction, Sita appears to float and dance unharmed above a large outdoor bonfire. Figures of human and monkey kings, including Hanuman, stand on both sides of the fire to observe how Sita endures the test unharmed, proving her purity and innocence. Click to see larger image. 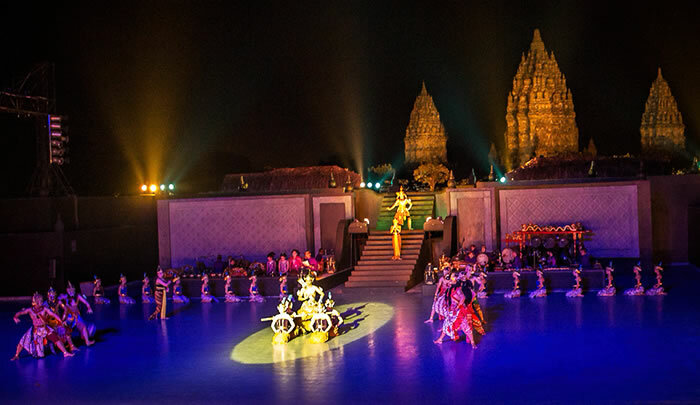 Ramayana Ballet performance in the Indonesian city of Yogyakarta with the ancient Prambanan Temple in the background. Click to see larger image . 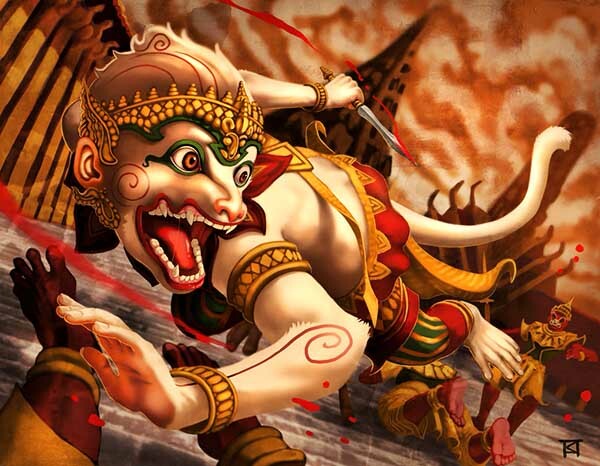 Modern rendition of Hanuman in classical Thai style. Click to see larger image. 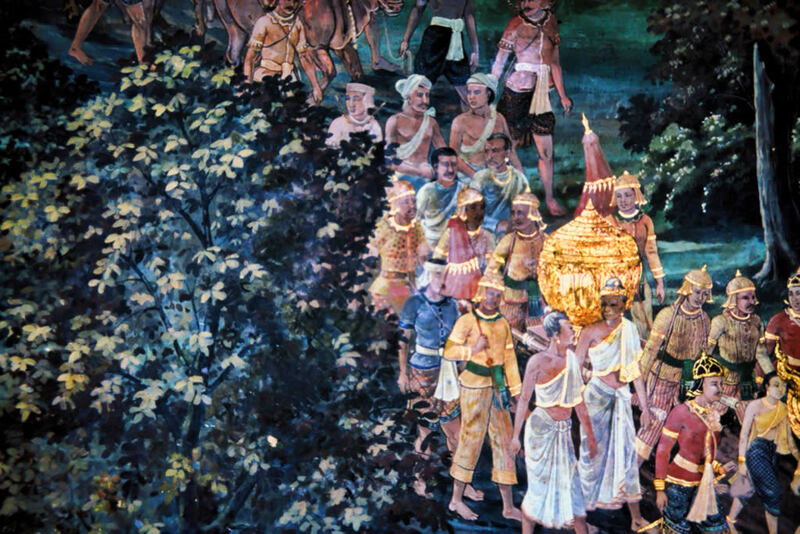 Rama’s army crosses the stone bridge to Ravana’s demon island of Lanka, as seen on a mural at the Emerald Buddha Temple. A golden, horse-drawn chariot carries Rama in its tiered-roof tower, as his accompanying army marches across the completed stone bridge. Rama’s monkey troops walk beside and behind his chariot. Click for larger image. 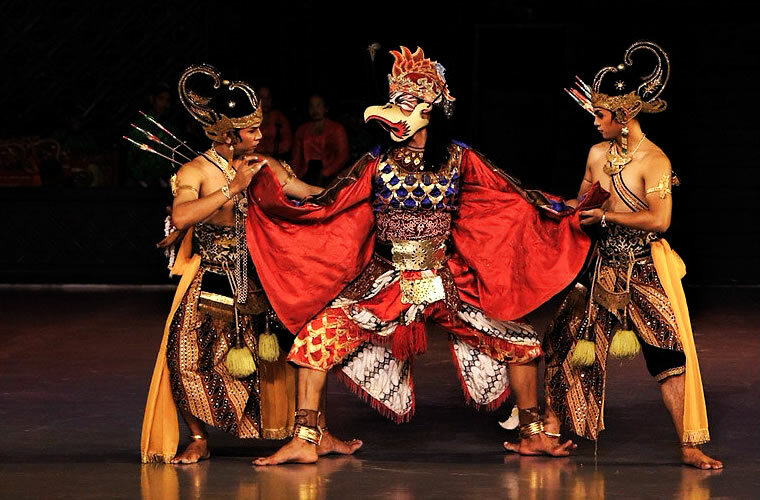 Ramayana performed in Java, Indonesia. Click to see larger image.